In France protests against the elcection system continued today. Many schools in Paris, Nantes, Rennes and other cities were closed due to blockades by students. In Rennes 3000 students took the streets, a cop pulled a gun against protesters. The #GenerationIngouvernable (“The ungovernable generation) continues to take the streets in France. After protests against the electional system on Sunday during the first round of the French presidential elections, students took the streets again today. Many schools in Paris, Nantes, Rennes and other French cities were blocked today and many students used the closed schools as an opportunity to take the streets. The protesters chanted “Ni le Pen!, Ni Macron!” and clashes broke out in several French cities. 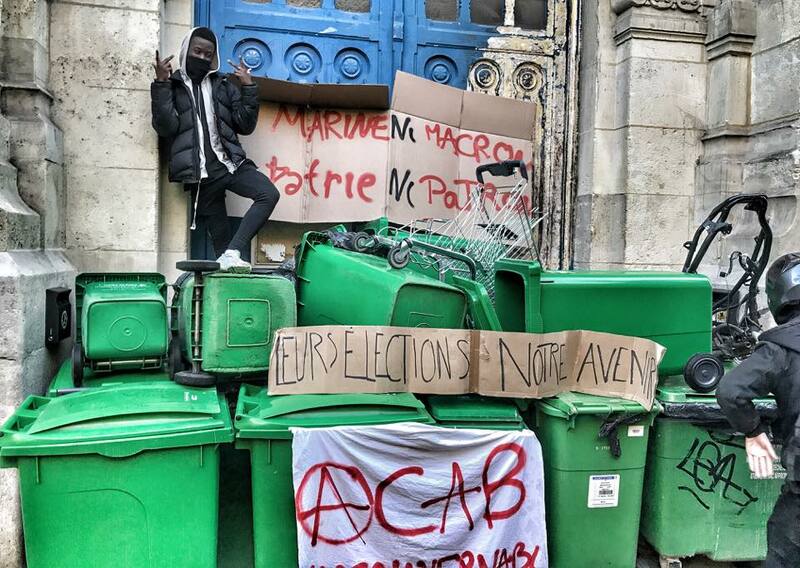 Students are again blocking school entrances again and again for months now to protest against the neo-liberal labor reform „loi travail“, the neo-liberal candidate Emmanuel Macron wants to enforce when he will win the second round of the presidential elections on May the 7th. The other candidate for the presidential elections is Marine Le Pen of the fascist Front National. Students also blocked schools and universities to protest against policve violence after a cop raped Theo and after the police murder of Shaoyo Liu earlier this year. During todays protests, fascists of the „Action Française – Île de France“ tried to disperse students who blocked a school. Clashes broke out between students and fascists, later clashes broke out between cops and protesters during a demonstration in Paris. Image: Screenshot of the fascist „Action Française – Île de France“ (with helmets) trying to disperse protesers at a school in Paris. In Rennes a cop pulled a gun against protesters during clashes earlier today (video). Previous post: #Vienna: #Squat in Kienmayergasse 15 Evicted – And now?